"Soave, a picturesque village complete with storybook castle and crenellated walls, lies just north of Verona in Italy's Veneto region. Its Classico zone encompasses about 4,200 acres over a series of volcanic hills, about 25 percent of the total area. The indigenous Garganega grape forms Soave's core. Sometimes it's blended with Trebbiano di Soave; locals are quick to point out that grape is different from popular Trebbiano Toscano, which they believe makes vapid wine, and which has been banned from the Soave region." Read more of this article here. That's the way to run your wine region. Hate a grape? Ban it! Normally I would be opposed to such extreme measures, but there is something about the way wine from Soave tastes that makes me think they know what they're talking about. The Bottle: There's not much in the way of information on the label, but the wine clocks in at 11.5% abv and is imported by Casa Torelli. Grapewise, it's 80% Garganega Del Veneto / 20% Trebbiano Del Veneto. If memory serves - I really need to start writing prices down - this wine cost me about $12 with a bit of a discount from the wine tasting where I bought it. The Nose: Once the bottle is open and the wine is poured, things start to get interesting. I picked up white peaches, pears and apples on the nose, along with a substantial sense of minerals. It pours up a lovely golden color in the glass, by the way. The Taste: Quite crisp and full of a sense of that volcanic soil that actually overrides the fruit, this wine features a wonderful nutty flavor which really hangs around a while. I figured this would be a good match with food, and I have been proven correct twice. At the tasting event, risotto was served - a Venetian recipe, with heavy cream, butter and parmesan cheese - and it paired very well. The Soave also tasted wonderful later with my wife's Angolan rice, chicken and delicata squash dish. She used grains of paradise in the broth, and the wine really set that flavor off nicely. If you're interested, you can find that recipe - and a world of others - at I Cook The World. If you haven't taken time to explore Southern California's wine country around Temecula, the perfect opportunity is on the way. 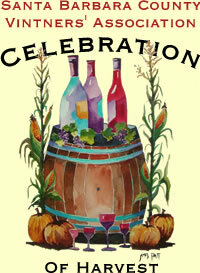 The Temecula Valley's Harvest Celebration Barrel Tasting Weekend is set for Saturday and Sunday, November 7th and 8th, 2009. The fun lasts all day, from 10 a.m. to 4:30 p.m. both days. This big event will allow you to enjoy visiting 20 plus wineries for paired wine and food sampling. You'll get first crack at newly released wines, unreleased wines and you'll be treated to barrel and tank samples. If you've never experienced wine this way, you should make it a point to do so. Nothing makes you feel more like a part of the wine experience than enjoying samples right from the barrel. If you have never visited the Temecula Valley, know that they feature not only one of my personal favorite wineries - Hart - but also South Coast Winery - the winner of the California State Fair Winery of the Year Award two years running! Tickets for the event range from $59 to $89 and can be purchased online. Go to the Temecula Valley Winegrowers Association website, or call 800.801.9463. The Bottle: Sporting a stylish purple - they call it "plum" - label, this entry in the Diamond Collection from Francis Coppola usually runs about $19. I found it as one of the "5-cent wines" at BevMo recently during their "5-Cent Sale." Buying one bottle at regular price and another for 5 cents brings the per-bottle price down to about $10, including tax. I'm sorry to go on and on, but I love getting a bargain. This inky-black wine comes in at 13.4% abv. The Nose: The aromas shown here are fruity and smoky. There's a cherry cola scent along with a little chocolate. The Taste: Coppola serves up a full mouthfeel on this Petite Sirah and it's quite smooth if given enough time to open up. I found a half hour made a big difference. The flavors are like blackberries and dark fruit with hints of vanilla to soften it. 16 months in French oak makes its presence known, but does not overwhelm. The wine is quite dry despite all the fruit that's happening on the palate. Be prepared for a bit of astringency after the finish. I would image this would be very nice with a rack of lamb or a pork chop. Personally, I think it's quite nice all by itself. grapefruit presence. I seem to get this every time I'm here. With good reason. I tried this wine a while back, and these are my notes on it. The pleasant vineyard drawing on the label is probably a view from Highway 46 outside of Paso Robles. I'm just guessing about that, but it's a nice picture anyway. Pardon the "borrowed" 2006 vintage label here, but I liked the way the picture showed in this shot much better than in the one I took. 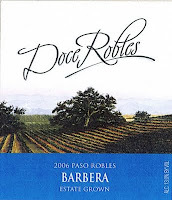 Estate grown, 100% Barbera grapes are aged 24 months in American oak. The alcohol runs 13.9% abv. Big licorice aromas right away reminded me of smelling a wine at a winery tasting - the nose always seems so much more powerful to me in a tasting room. Lots of berry fruit came through. They say on the label you should expect some raspberry, but I don't get that. Maybe a raspberry/chocolate blend. There was a very full mouthfeel, with a vibrant and oaky texture. This wine sat quite well in my mouth and fairly screamed for food. I tried a few gorgonzola crackers with it - thank you, Trader Joe's - but that didn't hit the mark. I would love to try it with an Italian dish, maybe a mushroom risotto. If memory serves - and that's always hit and miss - bought this wine for about $10 at Trader Joe's. I think it's well worth the money. Hopefully they won't run out before I get more. Great celebrations cry out for something bubbly. My wife and I celebrated a wedding anniversary recently and decided to crack open a Calistoga sparkler that had gone unused last holiday season. It was a wine we had bought for $28, if memory serves. The Bottle: A traditional Champagne-style bottle houses this sparkling wine. The label describes the wine as 100% Chardonnay and 13% abv. It's a Brut style sparkler produced in the traditional Methode Champenoise manner of secondary fermentation in the bottle. There is some barrel fermentation employed. The Nose: This Blanc de Blancs pours up a very pale gold with a tall white layer of foam on top. The nutty nose shows lots of minerals and a bit of a funky side, probably a by-product of the wood. The Taste: There's a strong sense of lime zest on the palate along with some tropical notes. It's a dry taste that frankly left me rather cold at first. I found that it grew on me, though, after a couple of of glasses. I don't normally have sparkling wine with food - I'm one of the few not that attracted to sparkling wine in the first place - but this time I had it with English farmhouse cheddar on a wheat cracker. It was really quite nice. Hollywood wine tasters were once again treated to a fun and informative night out by Nicolas Soufflet and Bill Gotti at Gotti's Hollywood restaurant, Victor's Square. The Thursday night soiree was a follow-up to Soufflet's previous Tuscan tasting, this time showcasing the wines of the northern areas of Piemonte, Friuli and Veneto. 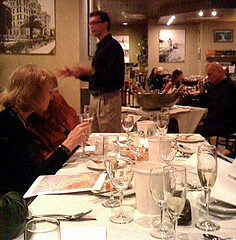 The crowd was a little larger this time around - our party of fourteen took over an entire corner of the restaurant - but it was still a very comfortable number, and all could hear Soufflet clearly as he imparted some of his extensive knowledge of Italian wine history. In addition to the wines, there was a lovely risotto with green peas presented by Gotti and his staff which served as a wonderful nosh while perusing the wine selections. Everyone was very complimentary of the whole experience. They loved the learning as much as the wine. Asti Classic Dolce Aromatico - From Asti in Piemonte, this is 100% Moscato Bianco. That's the oldest grape in Italy, and the vineyards for this wine were founded in the 9th century. It's produced by Casa Abbazia, as were several of the wines on the menu. It's very pale with a bit of a funky nose and a sweet, tangy, fizzy presence on the palate - a very nice opener, with only 7.5% abv. Friuli Aquileia Bianco Di Valpanera - A Friuli Aquileia white blend from Agricole Valpanera was next. This bianco is aged in stainless steel. It sits very pale in the glass with a floral nose and a crisp minerality. Those minerals are a Friuli touch, according to Soufflet. He pointed out that many French varietals are cultivated in Friuli. This wine features 40% Chardonnay, 30% Sauvignon Blanc and 30% Friuliano. I felt the Chardonnay was responsible for the nose, the Sauvignon Blanc for the taste and the Friuliano for the finish. 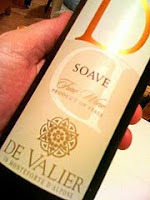 De Valier Soave Del Veneto - Our third wine was a Soave from Veneto. This comes in at only 11.5% abv, with white peaches, pears and apples on the nose, along with substantial minerality. There's a wonderful nutty flavor which really hangs around a while. This was particularly good with the risotto, which was a Venetian recipe - heavy cream, butter and parmesan cheese. Refosco Dal Peduncolo Rosso - The first red of the evening was perplexing. On first sniff, I and everyone sitting near me, picked up a strong scent of movie theater popcorn. "Odd," I thought, "but maybe it's the wood." Guess again, wine geek. This 100% Refosco Dal Peduncolo Rosso is aged 12 months in stainless steel and refined for three months in the bottle. I can't explain it except, as Soufflet offered, to say it's the terroir. The popcorn element did subside after a while, leaving a much fruitier aroma. It's a medium ruby color and a fairly tannic drink at first. A spicy pepper taste mixes with a cranberry flavor, but with a darker side to it. Soufflet told me that stainless steel aging of red wines is not uncommon in Italy. This wine is produced by Agricole Valpanera. Abbazia Barolo 2004 - The vineyards from which this Barolo is sourced date back to the 9th century. The wine offers a medium red color that is easily seen through. It appears to have already started turning colors on the edges. It's supposed to take on more of an orange tint with age. The tart candy nose is very fragrant and floral. The taste is quite dry and rather tannic. This wine drank rather hot and was not too smooth. It wasn't very well-received at my end of the table. Abbazia Brachetto Piemonte - This wine is red, red, red with a dark pink foam - gorgeous! The nose smells of figs and nuts with a fresh and juicy element. It's sweet and frothy on the palate, tasting of apples and strawberry. This wine was supposedly used by Cleopatra in seducing Julius Caesar. He reportedly found it almost as charming as Cleo. Here's the second in my series of Recession Buster wines. This one hails from Trader Joe's, home to many value-priced wines. It sells for $6, which is what I paid for it. This may turn out to be a nice value, too, as I have noticed some fairly good vino coming out of Lodi at very reasonable prices. The Bottle: Zinfandel is described as the lead character, with Petite Sirah and Malbec following. The label promises a robust, spicy and engaging wine which will drink well over the next five years. DnA Vineyards of Ukiah, California produces this wine, which is sourced mainly from Lodi. The alcohol clocks in at 14.5% abv. The color is a very deep purple, quite a lovely looking wine. The Nose: There is a tar-covered fruit aroma here that I find quite appealing. It's blackberries, I believe. It's a nice, open, pleasant smell - one that I most often notice when tasting at a winery. Accordingly, it brings up some nice memories. There's not a lot of alcohol present on the nose, either. That's rather surprising at 14.5%. I could just go on smelling it, it's that good! The Taste: Finally I relent and take a sip. These tannins are very active. The mouthfeel is medium-full, but it's rather acidic, unfortunately, and goes down hot. While it's rolling about in my mouth the taste is actually quite nice, but the rest of the experience is somewhat lacking. Perhaps letting it sit longer will tame it. I gave it about a half hour in the glass before drinking, and it does not appear to have been enough. Aside from that, it's not too bad. A spicy taste with lots of of black pepper on the berries gives way to a slightly vegetal sense that will hopefully increase over a couple of days. That's not too glowing a recommendation, I suppose, but my main problem with this wine is the extremely tannic nature. Footnote: After making these notes, it had been in the glass an hour or so and calmed down quite a bit. It became a very nice quaff. I should mention that it seems a little unusual this is a Zinfandel blend. It strikes me much more like a Syrah. Paraphrasing a line from O Brother, Where Art Thou?, I will spend a few posts sampling some bargain-priced wines to see how much bang I can get for under ten bucks. Here is the first in a series of Recession Buster Wines. The Bottle: The sleek Rhine-style bottle is one of my favorite wine containers. On my list, it comes in just after the box. Just kidding. The slender bottle may contain a sweet delight or a dry and pungent, well, delight. I can take a Riesling however it comes. This one is produced by Washington's "founding winery," as they call it, from vineyards in the Columbia Valley. The Chateau Ste. Michelle brand is well respected and readily available in a large variety of retail outlets. I don't like the way "grocery store wine" sounds, because there are many fine wines available at our supermarkets in Southern California. This brand is one you've probably encountered while shopping. It usually runs about $13, but I spotted it on sale for $7. The Nose: There is a trace of that wonderful petrol aroma right away, although it doesn't define the smell. It's a really gorgeous nose, with melon and minerals appearing stridently. Don't drink it too chilled - I'd hate for you miss out on the bouquet. The Taste: It's a clean and fresh taste on my palate with a variety of flavors. On one taste, the melon. On the next, some orange peel. Then there's that tinge of gasoline. And on each sip is the ever-present sense of minerals that really makes a white wine soar. In my mouth, a full and rich feel is accompanied by great acidity. This would be a perfect wine for a plate of grilled calamari or steamed mussels. 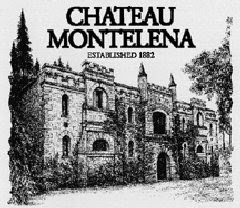 The Bottle: The front label features a drawing of the castle facade of the storied Chateau Montelena, the winery made famous in the 1976 Judgment of Paris. It was made even more famous in the movie about that event, Bottle Shock. 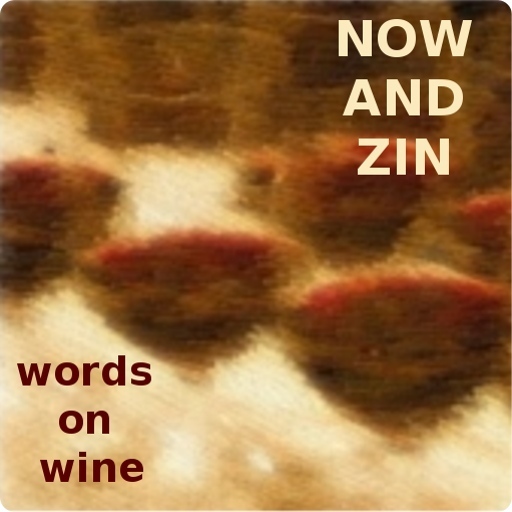 While it was their Chardonnay that galled the Gauls in America's bicentennial year, I am writing today of their Zinfandel 2006. 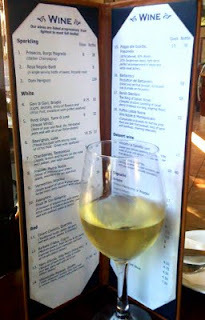 I also purchased a bottle of their Chardonnay during my visit to the Calistoga winery. I will cover that wine at a later date. This Zinfandel is 14.4% abv and cost $30 at the winery. It's an estate wine, grown, produced and bottled on the beautiful grounds of the winery. I was told in the tasting room that it's a 50/50 blend of Zinfandel and Primitivo, Zin's Italian relative. The Nose: This is an extremely fragrant wine. Ruby red in color and not fully opaque, there are smells of currants and blackberries on the prominent nose along with an earthiness and a slight floral note. The Taste: It tastes full and rich. Cherry is the highlight, but there is a darkness to it. It's a beautiful and menacing taste at once. The tannins are almost silky in this well-balanced wine. Finish is lengthy and just as delicious as the drink itself. I have seen quite a bit about the new requirements the Federal Trade Commission is placing on bloggers. Full disclosure is now a requirement. Whenever I write about a bottle wine, if it came to me for free, I must disclose. If a winery offers me a tasting without charging me for it, I must disclose that when I write about the visit. If a publicist offers me a place on a press junket to Napa Valley, that disclosure must accompany the article I write about my experience. Many journalists who work for magazines, newspapers and websites already operate under the restriction that everything must be paid for by the media outlet. This stance allows the writer to write whatever he or she needs to write, supposedly without consideration of the benefactor. Of course, when magazines pay for something so that a writer can write about it, and that something happens to be the subject of paid advertising in that very magazine, who is to say there is no external pressure applied on the writer to "like it." Bloggers, however, are usually not listed on NASDAQ, and as such are sometimes obliged to take the offer of a "comped" trip in order to write about something they might not otherwise be able to experience. Personally, I never read anything without wondering who's footing the bill. If Wine Spectator showers praise upon a Sonoma County Pinot Noir, how do we know they're not dirty? Sure, the Russian River Valley in Sonoma County is a source of truly fantastic Pinot. But did the magazine receive that wine as a free sample? Do Sonoma County Vintners advertise in the magazine? What about the Sonoma Chamber of Commerce? Maybe it's just that the wine is good. When does a bona fide piece of journalism become a puff piece? Sometimes it's hard to tell. Most of my writing seems like puff to me. That's because I mainly write about things I like. My writing time is limited. Why spend it writing about something that displeased me? It would be easy for someone to jump to the conclusion that I got a wine for free, or was given a tasting gratis based on a favorable article. That doesn't mean it's the case. When I write about wine or wine tastings, most of the time I am writing about something for which I put hard-earned money on the barrel head. There are times when a tasting room manager will offer me the tasting for free, knowing that I am doing research for an article that will mean publicity for the winery. Is the article I write about that tasting room tainted? Other times, they may not know who I am, but when I purchase a bottle they waive the tasting fee. If I review them favorably, am I guilty of some sort of vin de payola? Sometimes I pay for a tasting, and after it's done they offer me another taste or two of other wines. Does that taint the entire paid tasting, or just my opinion on the last two wines, which were free? I can see right now, the bookkeeping on this is going to be a real pain. For the record, my take is this: Some things need to be regulated. In general, though, the less the government has to do with my life, the better I like it. I don't see this issue as something that really needs to be regulated in the first place. But since our legislators seem to think it does, I imagine it will be. Just know the following. Whenever I write good things about a wine, it will be because that wine had good things to offer. If you don't see too many negative remarks here, that's because I don't sit around drinking bad wine. Well, there was that "Two Buck Chuck," but it actually wasn't all that bad. When I was a rock'n'rollin' teenager, I began to read Rolling Stone magazine, in particular for the record reviews. I didn't need to be told what to like, but I knew from reading these writers' past reviews what to expect based on their stated opinion. If a reviewer had a history of favorable reviews toward a certain artist, I knew that reviewer was likely to give good reviews to more of the same. If more of the same is what I was after, I'd hope to see a favorable review from him. If I wanted something different than that, I'd hope to see him pan the music. If he did, maybe that new album would be right up my alley. In any case, I'm pretty sure those Rolling Stone record reviewers from 1970 were getting freebies. But they wrote what they felt about what they heard. Knowing the writer's preferences made it easy to discern whether I should plunk down my paper route money for that music or not. Now, of course, there are thousands of outlets where product reviews are available. It would be too much to ask that people follow reviewers closely enough to get inside all their heads , which probably wouldn't be a very pleasant place to be anyway. If, however, I tell you a wine smells like cat pee and that's the last thing you want your wine to smell like, you know which way to go. All I do in Now and Zin is write my impressions. Take them with a chunk of sea salt, if necessary. But know that, if nothing else, they are honest impressions. The Celebration of Harvest in Santa Barbara County is an October tradition - a time when the vintners in this amazing winemaking region take a little break from harvesting their fruit and roll out some of their wares for tasting in a centralized location. Rancho Sisquoc Winery will serve as the scenic locale again this year. Celebration of Harvest occurs Saturday October 10, 2009 from 1:00 p.m. to 4:00 p.m. 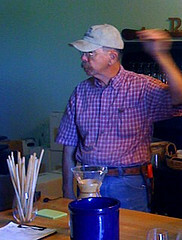 The entire four-day weekend, though, features special events and tastings at many of the individual wineries. Tickets to the Celebration cost $65, $25 for designated drivers, and there is a "Vintners' Visa" ticket for $35 that includes events at a selection of other wineries over the four-day weekend. Beyond these events there are tons of other activities at nearly all the wineries. Check out the Santa Barbara County Vintners' Association for all the juicy details. I have been drinking quite a few Italian wines lately, not because they are necessarily my preference, but because my wife, Denise, really loves them. Don't get me wrong - I really love me some good ol' Italian varietals. I just prefer exploring the wines of California more than any other area. I hate to drink alone, however, and if the wife has an Italian wine open, that's okay by me. It's possible the reason she's so drawn to Italian wines is because it's in her blood. Her family tree has roots in Sicily. And she does seem more drawn to Sicilian wine than the other regions of Italy. Whatever the reason, when we can enjoy a glass of wine together, it's a good thing. I can compare two wines made from Sicily's most important red wine grape, Nero d'Avola. From the southern town of Avola, this grape was long used primarily as a blending grape. Since the 1980s, though, it has stood very well on its own. The characteristics a Nero d'Avola shows are somewhat akin to those of a new world Syrah, so this would seem to be a nice varietal for a California wine guy like me. 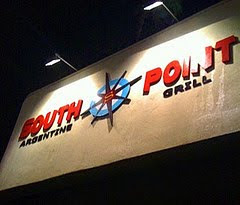 First, a bottle from home, then a restaurant selection. Ruggero di Tasso Archeo Nero d'Avola 2007 - True to its reputation, I found Syrah-like pepper on the nose and palate with ripe berries in the forefront. A vegetal note also came into play that I found intriguing. The texture is smooth, but the medium mouthfeel left me wanting something a little more substantial. There's a decent amount of acidity and it would probably fare well with a nice pasta dish or some Italian sausage. The finish is not too dramatic. It's serviceable enough, and I think it usually sells for under $10, so expectations shouldn't be too high. The restaurant selection came at Il Buco on Robertson in Beverly Hills, a favorite of ours. The wine was Cataldo Nero d'Avola 2006. If the Tasso didn't quite satisfy my new world taste, the Cataldo certainly didn't. A big, fruity nose with blackberries, plum and pepper came off as perfumy - even my wife wrinkled her nose a bit. There was a vegetal note on the back end in this wine as well, but it served more as a curiosity than anything else. The wine had good color, but unfortunately I found the taste not so much "medium" as "thin and watery." It was not my style, although its fruitiness and freshness would no doubt be attractive to some. It was a very lightweight entry. Neither of these wines held too much interest for me. They were both drinkable - the Tasso more than the Cataldo - but ultimately I like a little more body in a wine.